Enjoy the holidays without the decorating stress. The Gilded Lily can transform a room or a whole house, from interior to exterior needs. 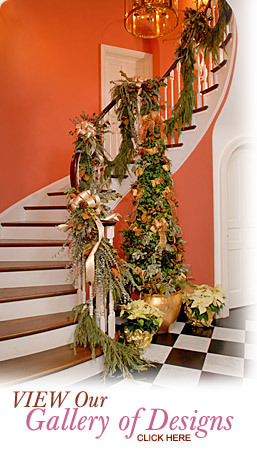 We incorporate your style and transform your home into a festive atmosphere. Choose from many special holiday themes, which can be changed year after year. We can adorn your home with lovely decorations that we provide, use decorations that you already have or any combination of the two. After the holidays are over, we'll pick up our decorations and gently store your decorations in your home. 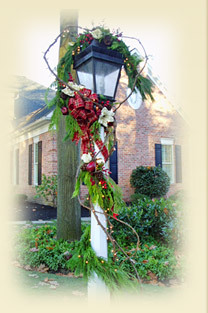 The Gilded Lily creates holiday displays on-site of home or business. 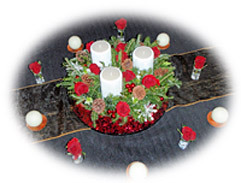 Some items, such as wreaths, can be brought in or pre-made in our custom shop. The Gilded Lily maintains your holiday display from watering Poinsettias, fresh green arrangements, to the Christmas Tree. When the holidays have past, The Gilded Lily comes in to dismantle and store all decorations. Existing clients love to get their properties or businesses noticed through our dramatic tree lighting effects. Thousands of white or multi-colored lights create a dazzling, head-turning display.